Direct action, protest and public advocacy are essential elements of movements for social change. Here in the United States, the government has falsely arrested countless protestors, curtailed their free speech rights and attempted to intimidate them from engaging in demonstration activities. Since its inception, People’s Law Office has defended dissent and advocated for those engaged in progressive and radical social movements. A significant amount of the work of the office is connected to defending civil liberties and representing the activists and community members who are on the front lines, fighting for change. 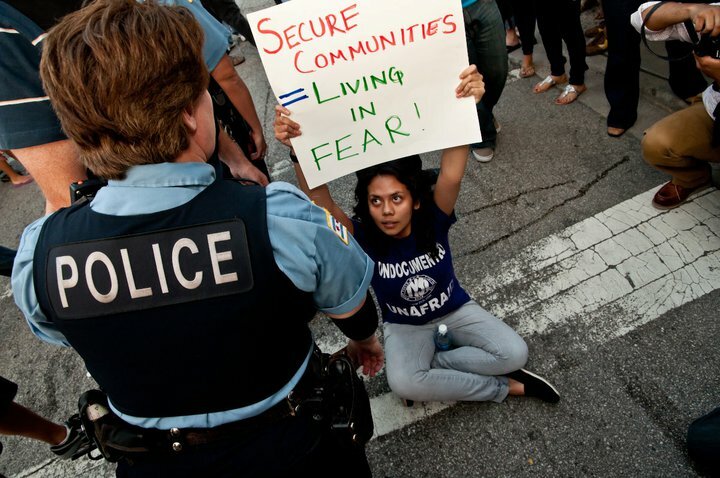 Lawyers and legal workers from People’s Law Office were actively involved in the defense of Occupy Chicago protesters, authoring and arguing a motion to dismiss that the City’s criminalization of the Occupy Movement is unconstitutional. Along with other National Lawyers Guild members, People’s Law Office was also active in the legal support for the demonstrations against the NATO Summit here in Chicago in May 2012. In 2003, People’s Law Office coordinated the successful legal defense of hundreds of peaceful protestors who were falsely arrested and faced criminal charges as a result of a huge demonstration against the U.S. invasion of Iraq. People’s Law Office attorneys and others also filed a class action civil rights lawsuit on behalf of these protesters, and hundreds of others who were illegally detained in police stations and on the street. Although the case was initially thrown out, the legal team successfully pursued an appeal to the 7th Circuit Court of Appeals which issued a far-ranging opinion significantly declaring the rights of demonstrators. In 2012, the City of Chicago finally agreed to settle the class action by paying $6.2 million to compensate class members for the unlawful police conduct. This current work defending dissent continues a proud tradition. Many of the office’s early clients were members of the Black Panther Party, the Young Lords Organization, the Puerto Rican Independence Movement and Students for a Democratic Society. Throughout the 1980s and 1990s, lawyers from the office joined with other members of the National Lawyers Guild to provide monitors at demonstrations, and successfully represent activists arrested for acts of civil disobedience and direct action in criminal court. People’s Law Office clients were involved in issues ranging from defending a woman’s right to choose, homeless advocacy, queer activism and disability rights to taking stands against war and intervention, apartheid in South Africa, CIA recruiting on campuses and discriminatory hiring. The office led the legal support and representation of hundreds of arrestees who arrived in Chicago from all over the country to participate in several national demonstrations called by the AIDS Coalition to Unleash Power (ACT UP CHICAGO). After a peaceful march during the 1996 Democratic Convention, police arrested and charged five individuals with felonies and People’s Law Office successfully coordinated their defense which resulted in complete acquittals. Attorneys at the office have also represented activists when faced with civil lawsuits against them in cases of injunctions, prior restraints or contempt. People’s Law Office’s work representing individuals charged for their political organizing continued into the 2000s. Attorneys from the office have represented activists from numerous social movements, including people fighting against police brutality, anti-war activists, environmentalists, immigrant rights activists and international solidarity activists, along with numerous other movements. 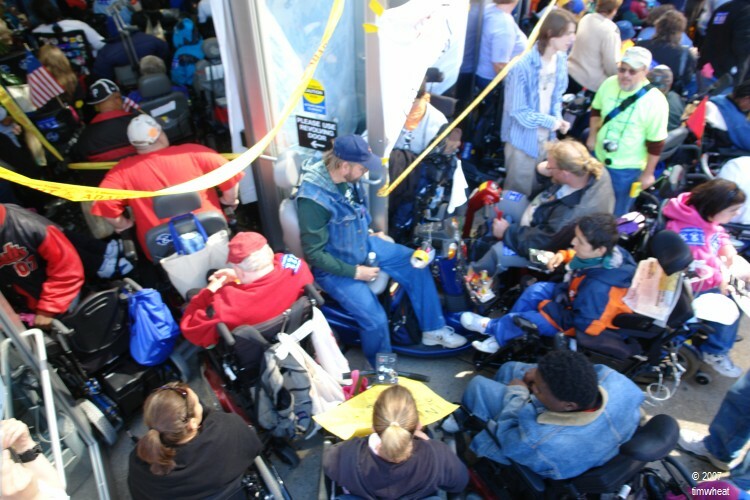 In 2007, attorneys from the office represented over 150 disability rights activists from ADAPT, who committed civil disobedience to demand that individuals with disabilities have the right to choose community services rather than be forced into a nursing home or institution. People’s Law Office is proud of its history and tradition of supporting those who dissent and defending those who exercise their Constitutional rights, and is committed to continuing to defend these rights against government intrusion and repression. Anti-War Class Action Lawsuit Gets Final Approval: Great News!